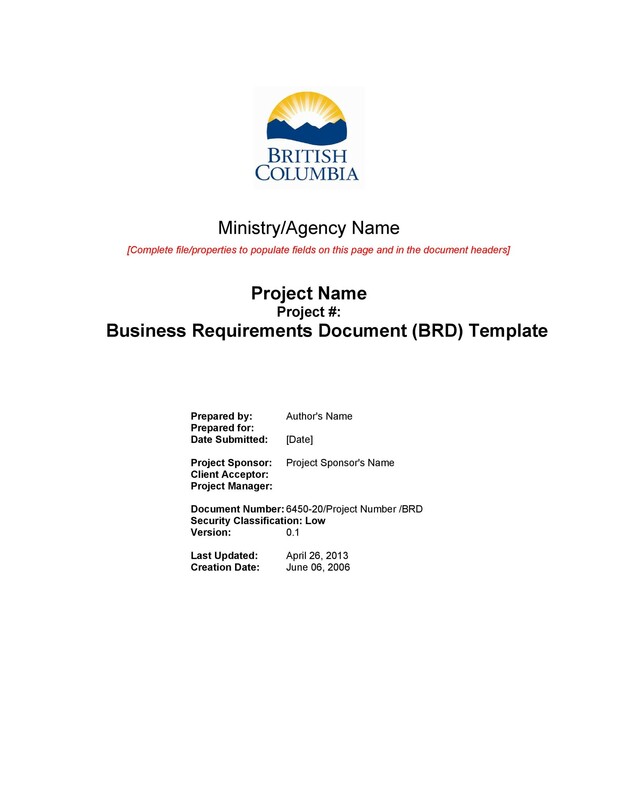 A business requirements document template, sometimes called a BRD, is an important document relating to a business project. 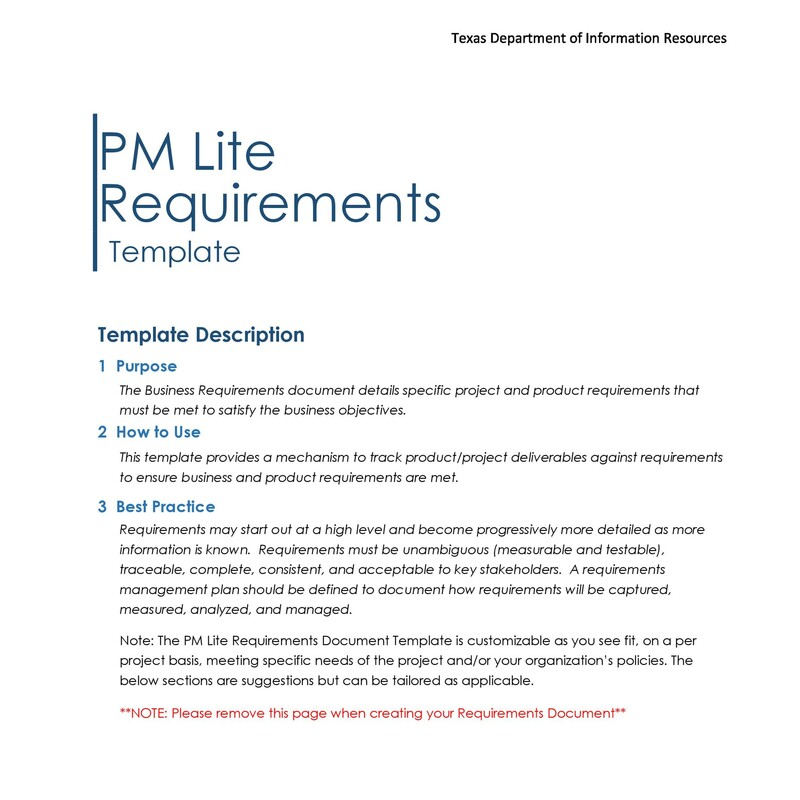 A business requirements document template helps describe the objectives of the business in question and what a brand new or improved product will offer to consumers. 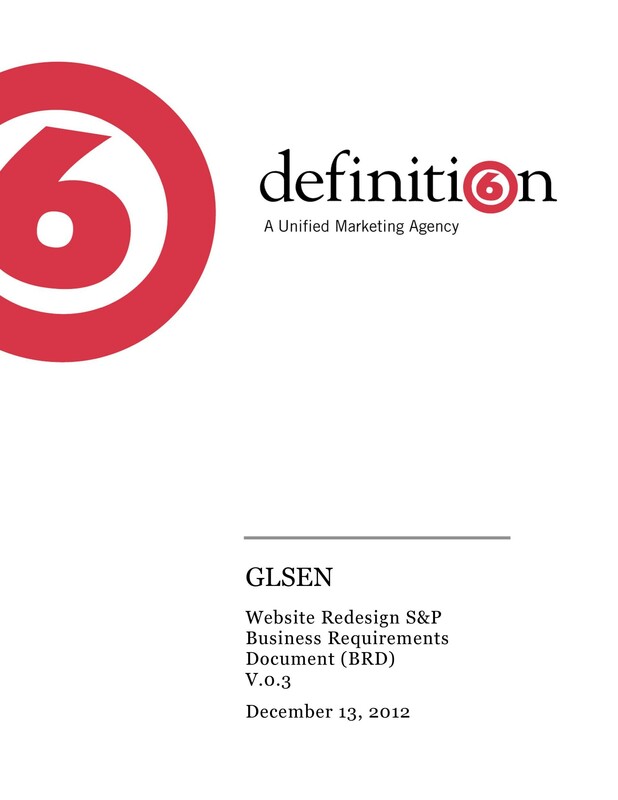 When a business or organization relies on a template, it makes it far easier to define the project, its features, and the anticipated outcome of the project or product in question. 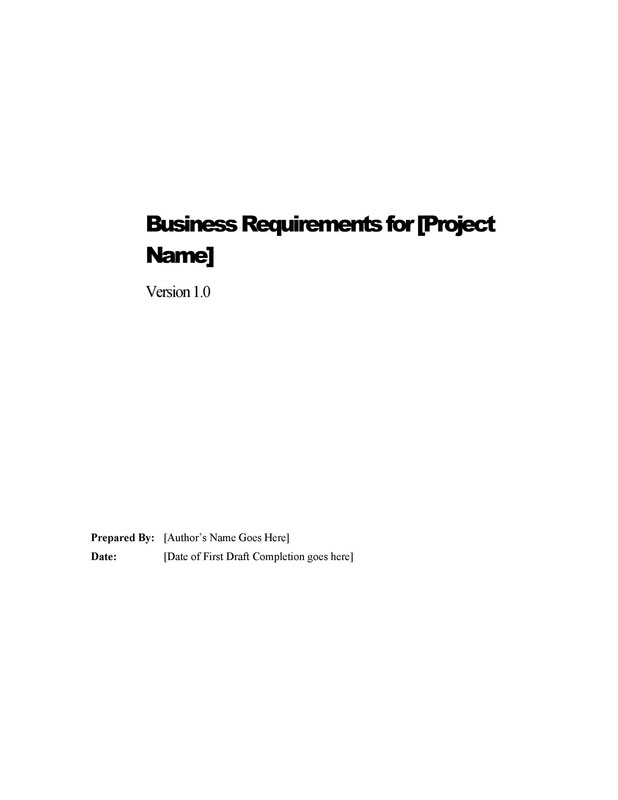 Since a business requirements document is a document of high detail, many businesses will make use of a professional template to ensure all the necessary basis are explored. To miss a single aspect within the business requirements document is to run the risk of losing out on a profitable venture or a means of lucrative marketing. 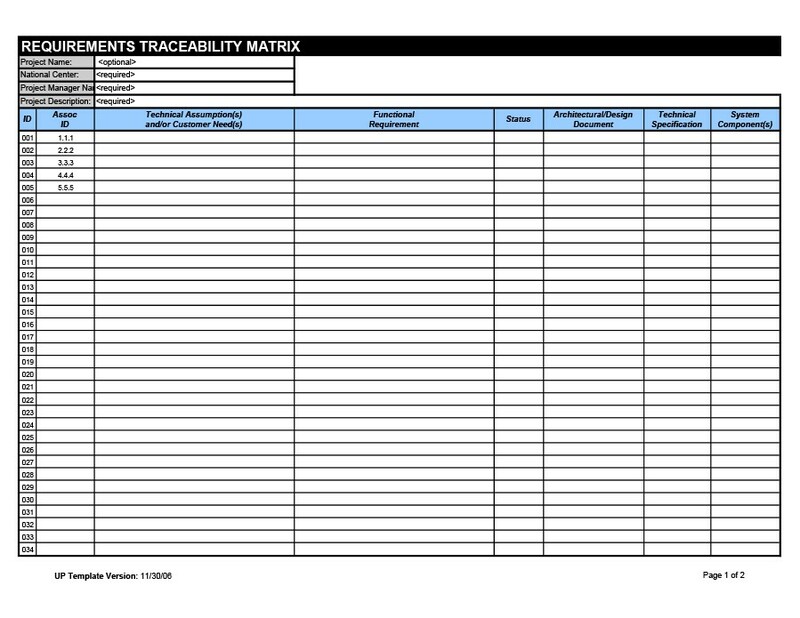 This document will contain information about the logic behind the product’s creation. If there are challenges the company will face in the production of the product, this special report defines the product production challenges ahead. The most common types of businesses to rely on the use of this specific and professional template are IT businesses and companies that focus on the creation of software programs. 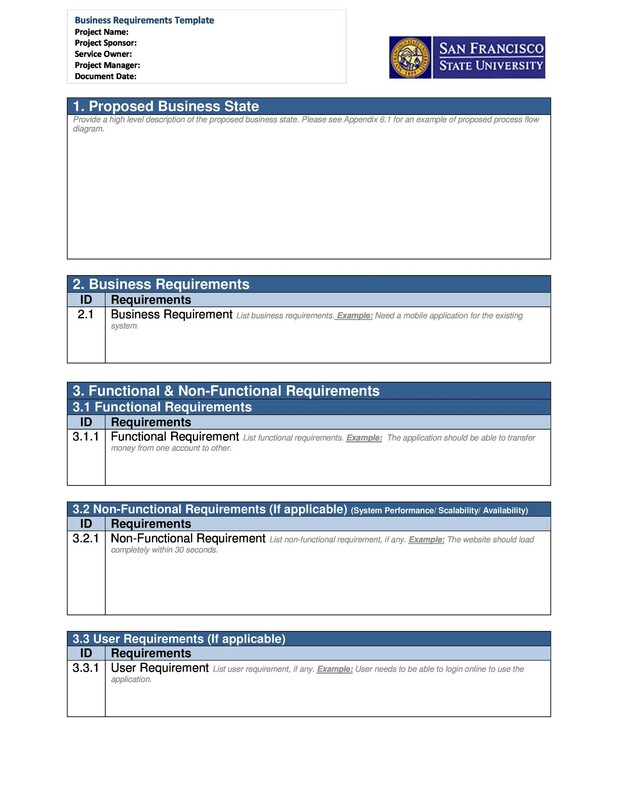 The usage of the business requirements document template combines the feedback from company stakeholders along with a full assessment of the business’ condition at the time just prior to the document’s creation. It is a report offering unbiased information and a full description of how a product will work, it’s operation, and it’s intended purpose. 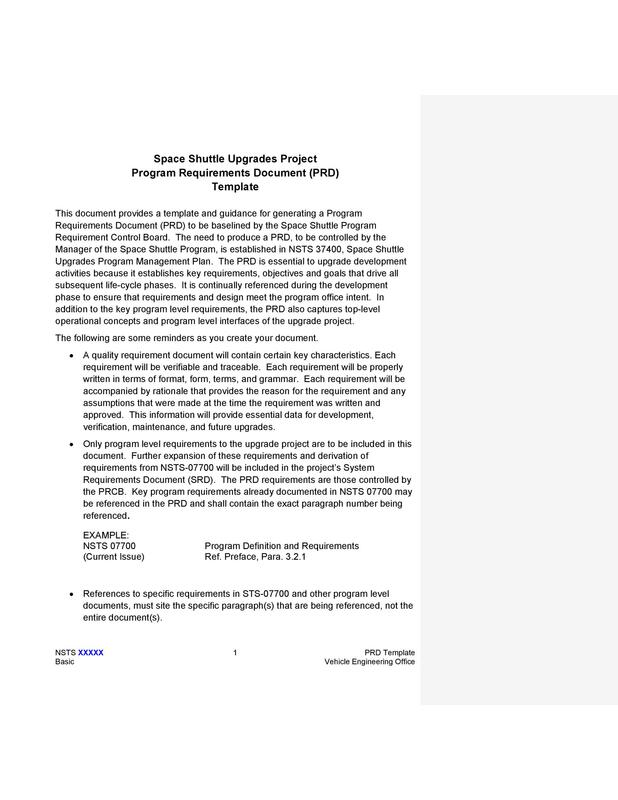 This document reveals the production process from beginning to end. Diagrams and data flow information are part of the document contents. These features help in illustrating the As-Is production process in its current state. It will also help to illustrate the state of production as it undergoes advancements and improvements. 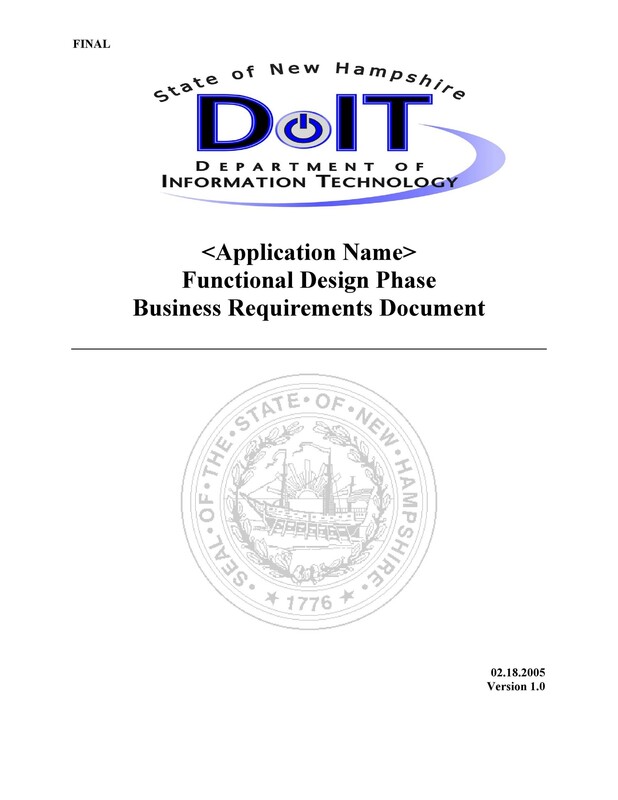 The business requirements document is most often used regarding the development of software application but could be used to develop any product or service, since it describes business needs and goals, the processes required to meet them, and the key operational and environmental factors that influence what is built and why. When a company identifies a hole or gap in the marketplace, they might develop the perfect product to fill that gap. Of course, the product only comes into being if it is determined to be a lucrative venture. This means the process of production comes into question. 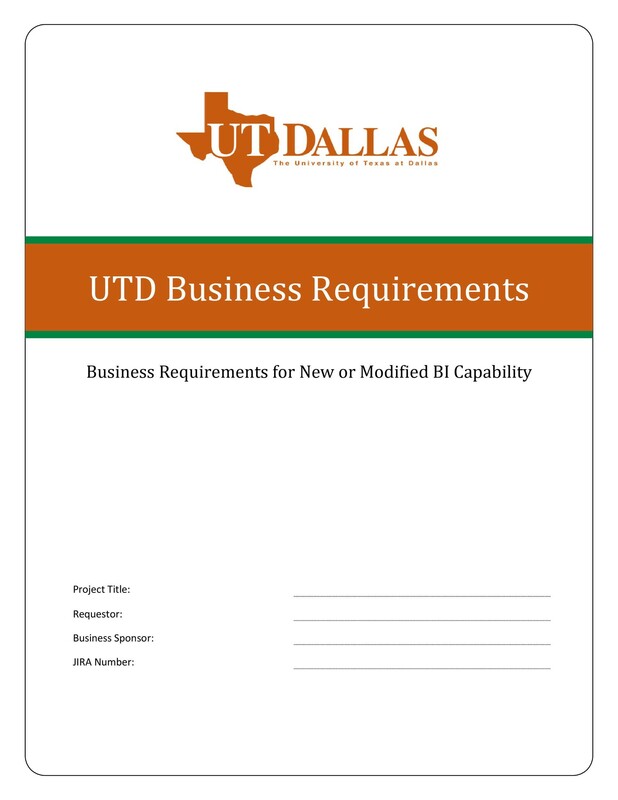 The business requirements document proves a valuable report revealing what it takes to produce the product, it’s objective, how it works, and the intended use for the end user. It allows a business to assess potential cost factors as well as production risks. It is like a well-designed written plan showing the steps it takes to create the product or bring the project to life. 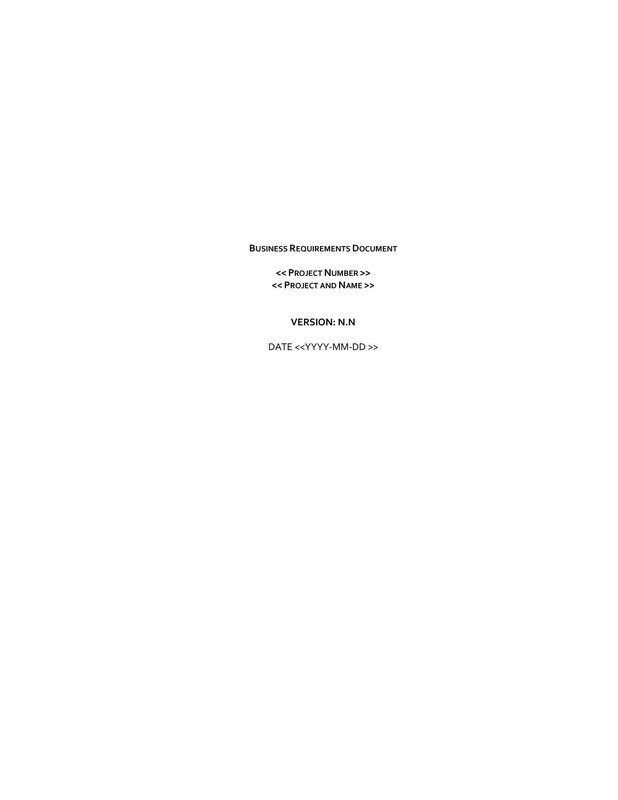 This document gets completed once a professional business analyst examines the current state of a business. The analyst will use data and feedback from users. The feedback consists of uses cases. 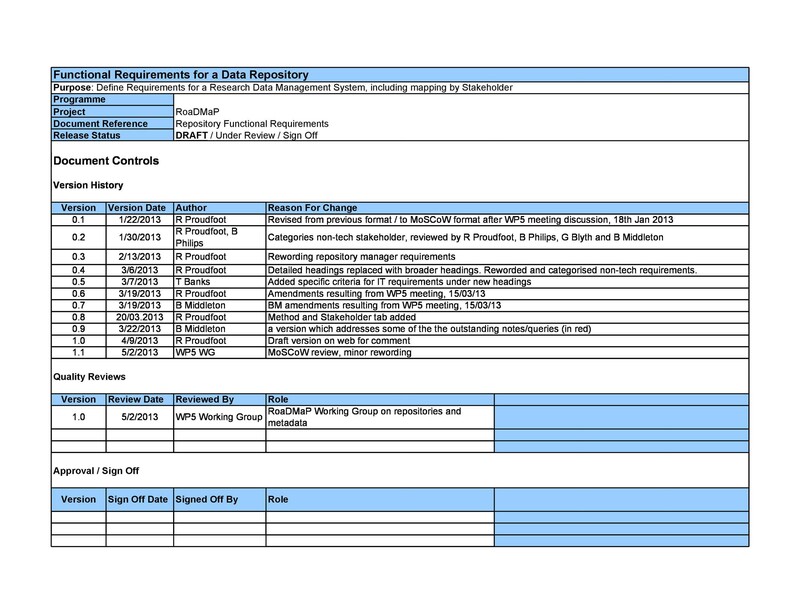 The collected data is entered in a distinct document complete and separate from the business requirements document. The business analyst does not work alone or in a vacuum. The professional will work along with IT experts, technology professionals, and project managers to assess any limitations, dangers, or threats of loss that might exist. The goal is to take any guesswork out of the mix and to put a stop to whatever limitations or risks that are identified before the product’s production or project’s undertaking. This step is crucial so the team developing the product’s design or project’s purpose can work out design and technical specifications. 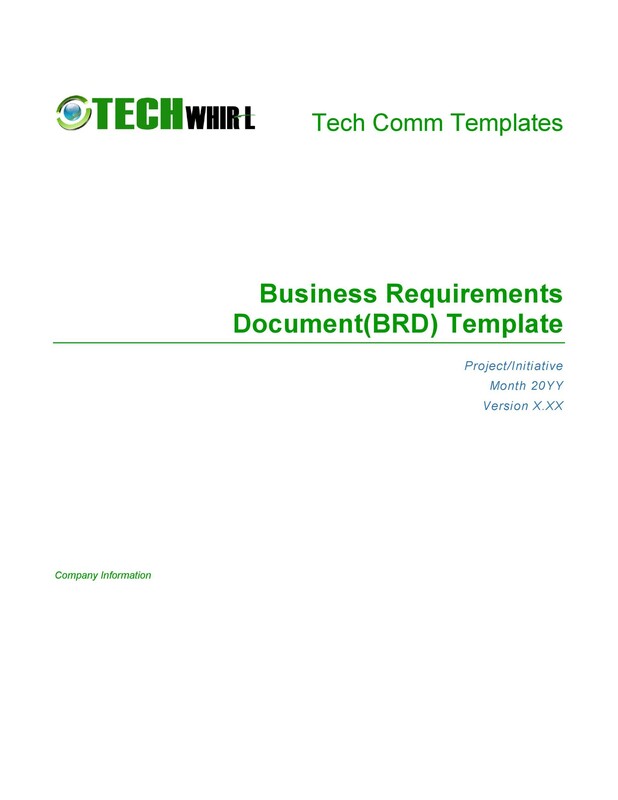 With the significant weight of importance on the information, a BRD contains, it is no surprise businesses rely on the business requirements document template to ensure every base is covered. 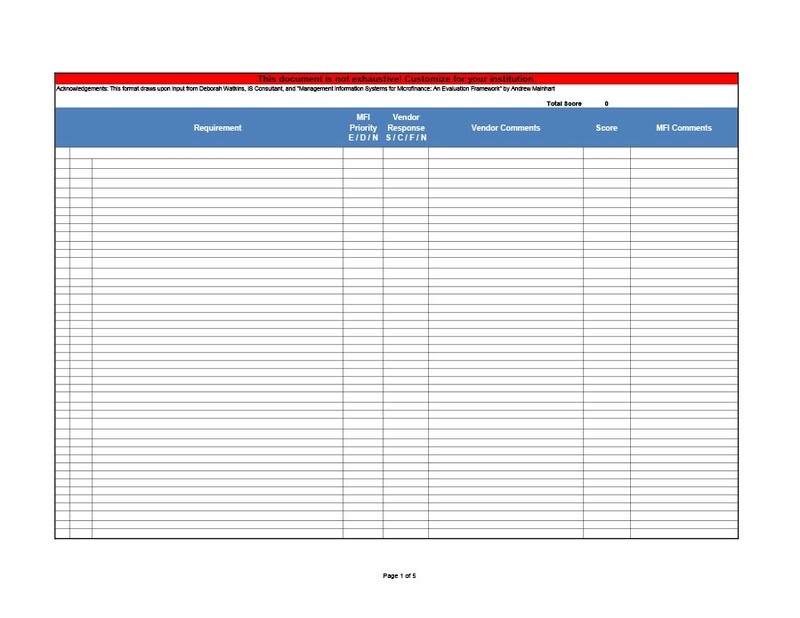 The template contains easy to fill in sections so that all aspects of the report help bring together the various sources of information. 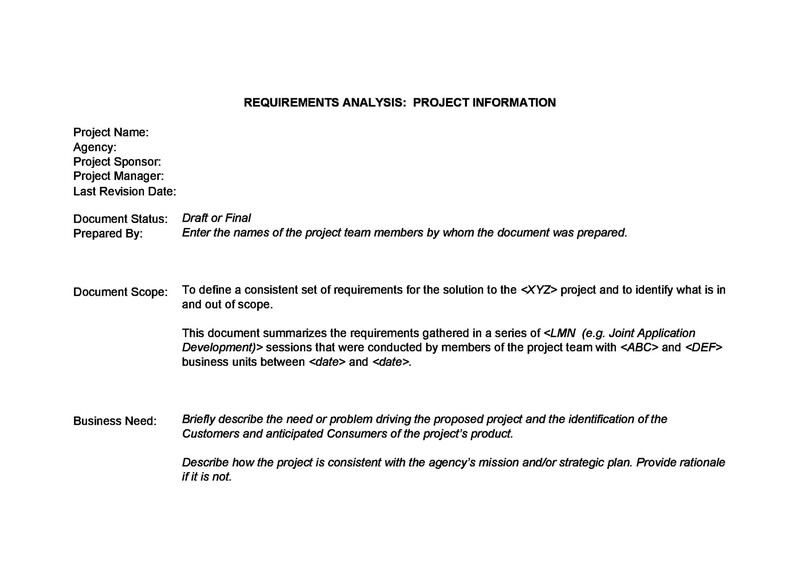 It allows for a linear, clear, concisely written assessment of the data collected by the business analyst. 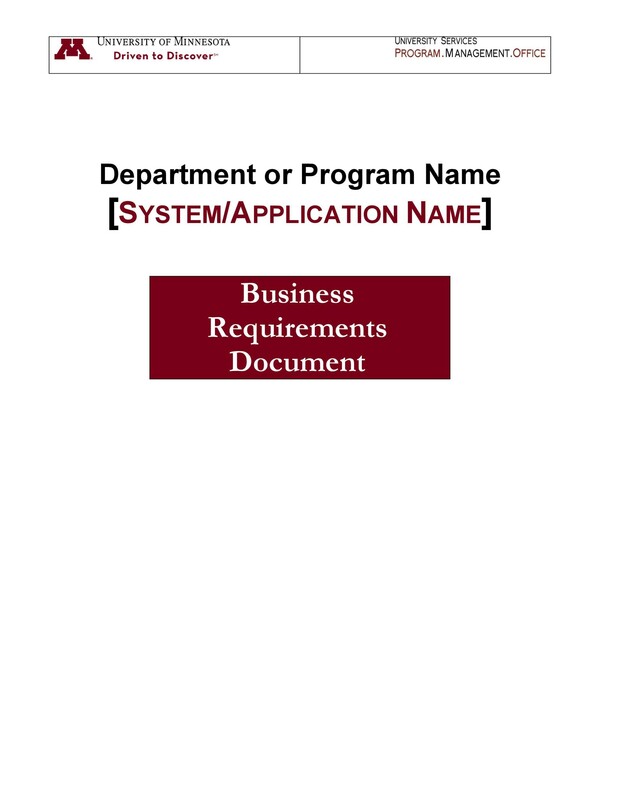 The business requirements document template has exact descriptions of a systems’ anticipated operation. It examines potential cost factors and gives evidence of how a company can achieve the desired result of the completion of a product or the manufacturing of a product. The project or production is broken down into phases or stages. Each stage is then examined from beginning to end while viewing the necessary input and output needed to realize completion so the next stage can begin. Functional aspects of the system, non-functioning aspects, and possible advancements or improvements are also taken into consideration. 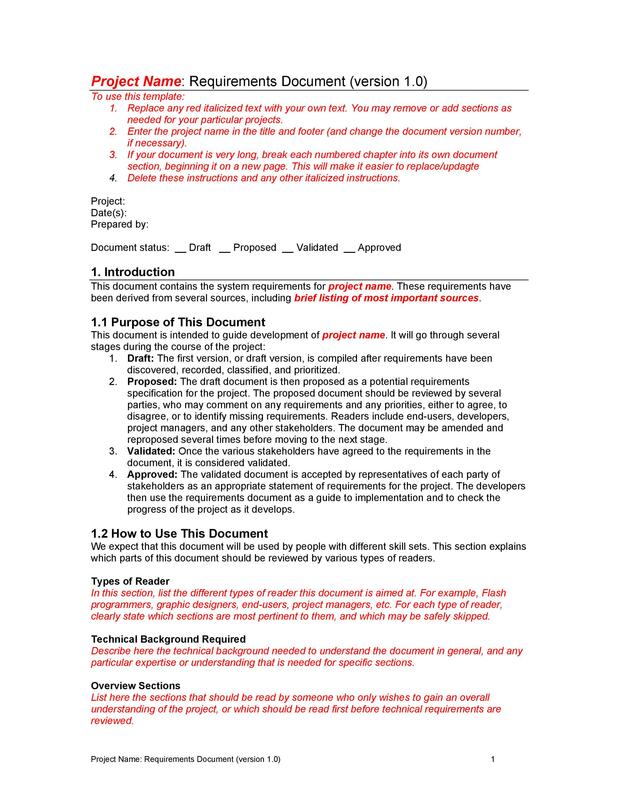 The document makes clear what a project manager will require so the individual can make sure the objective the company desires is realized in short order. 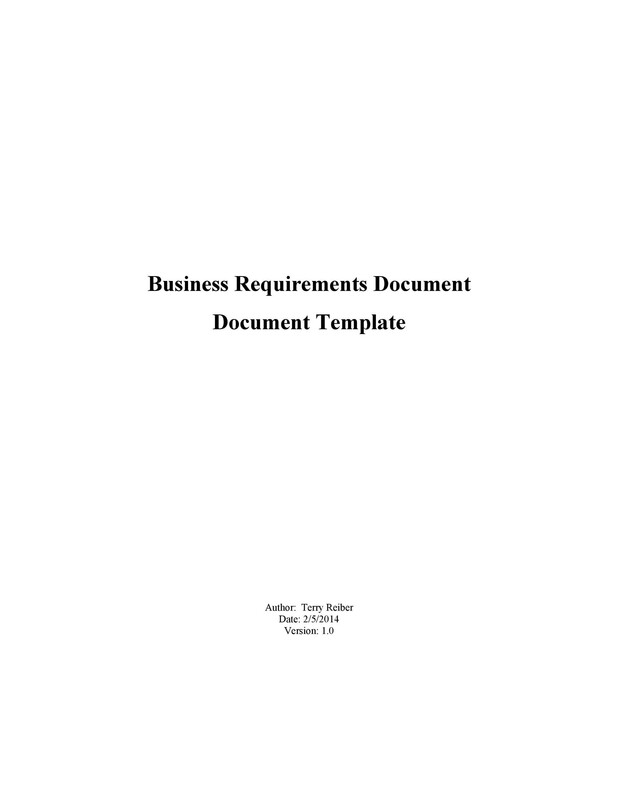 The business requirements document template contains details on an objective for the business. It also makes clear the technical objectives of a project or product. 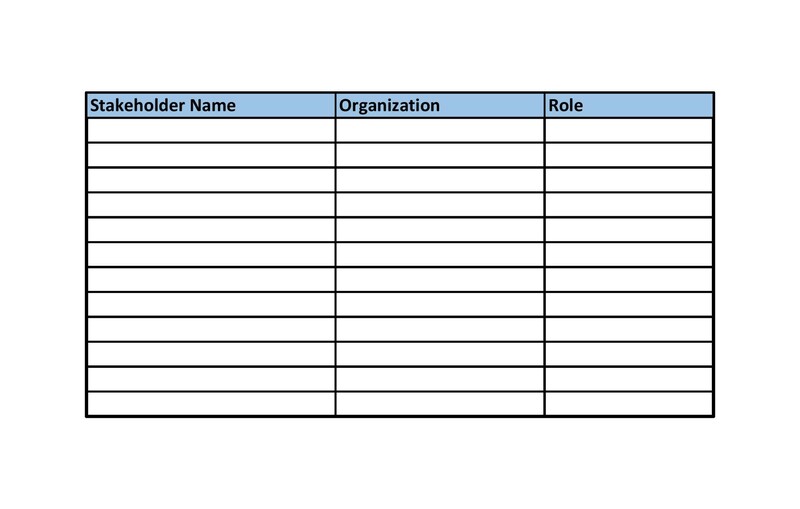 The document contains details that will answer questions like where the organization is heading in the future, the goals of the organization, and the ultimate mission a business wants to fill. 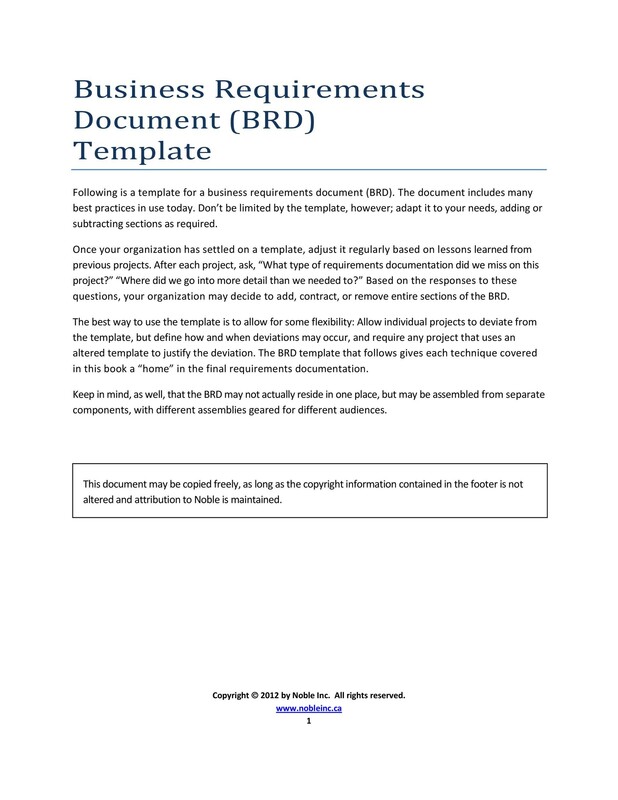 With a focus on technical aspects, the business requirements document template contains details on how the business goes about meeting the mission they choose to fill. Complete and concise details on the project phases and the input at the beginning and end of each phase. Details on how the system, project, or product fills the needs of the business, customer, or both. The ultimate solution the result supplies to interested parties. How the project, product, or solution will prove accepted by any stakeholders. 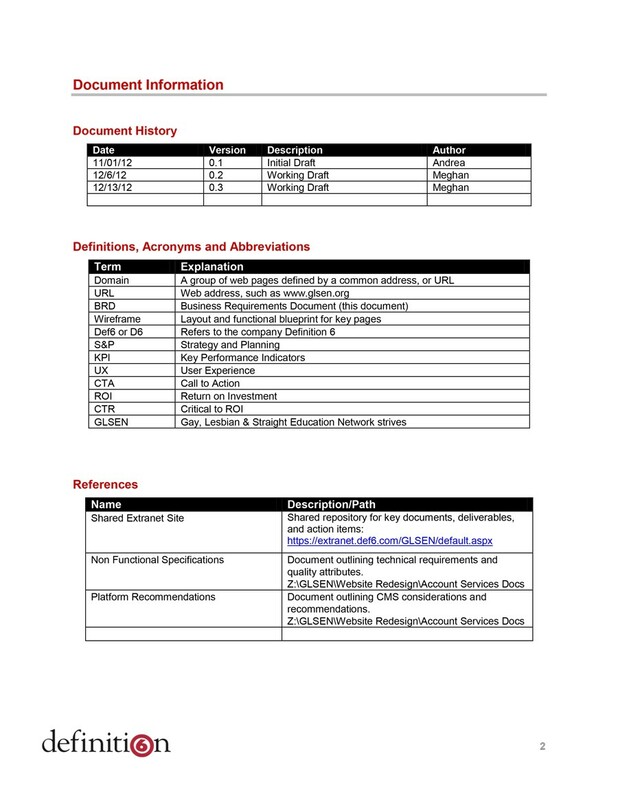 Information on the author(s) of the report and their background. This is made available to prove the person creating the document has the knowledge and experience to make a fair, concise and wise decision and prediction about the future of the business’ objectives. The potential risks, limitations, assumptions, and conjectures existing in relation to the project or product production. The problem the business is seeking to solve and why or the gap in the marketplace a company seeks to fill and the benefits thereof. Any potential restrictions the company faces in creating this solution, product or in the project’s completion. The time it will take to invest in the completion of the company’s mission. The financial factors influencing the completion of the company’s solution, project, or product. The investment risk assessment allows for the business to go into a venture with eyes wide open. It gives them a full understanding of the possibilities, risks, and this allows the company to weigh the consequences of any investments and to limit any potential loss from projects that might not be beneficial in terms of financial investment. 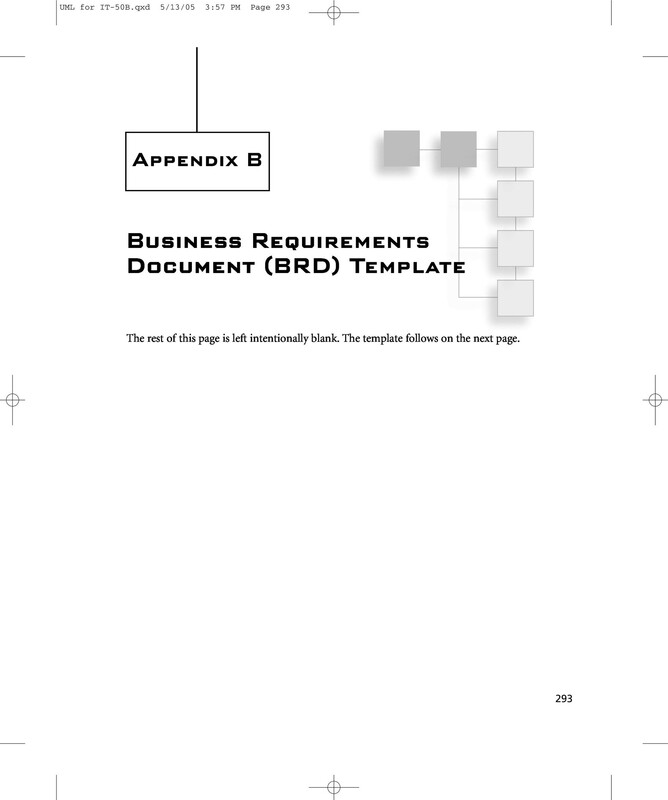 A business requirements document template is a special document that needs to be clear and linear in its presentation. It must be put together in a professional way so those who view the document do not face issues when it comes time for the material review. The only thing the reader should be concerned with is understanding the material presented. 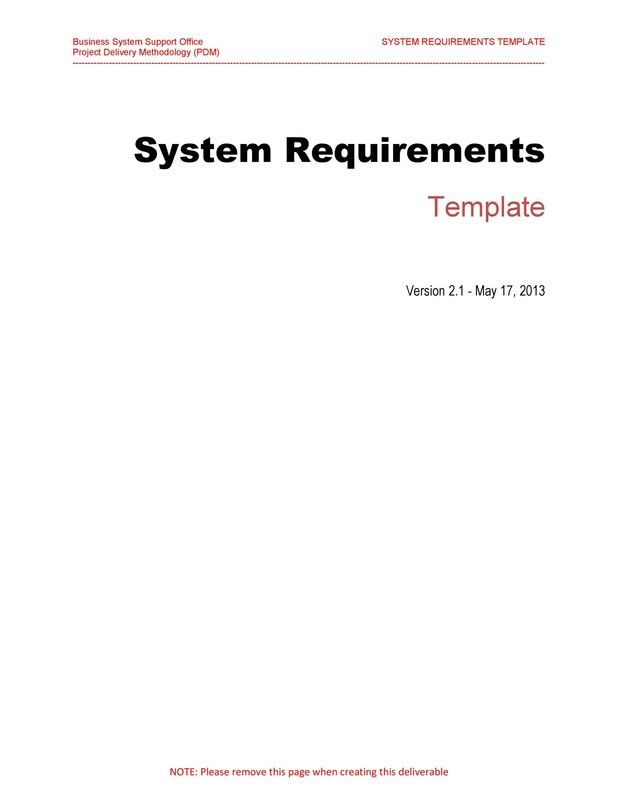 Below you’ll find some of the basic sections you will find in a typical business requirements document template. 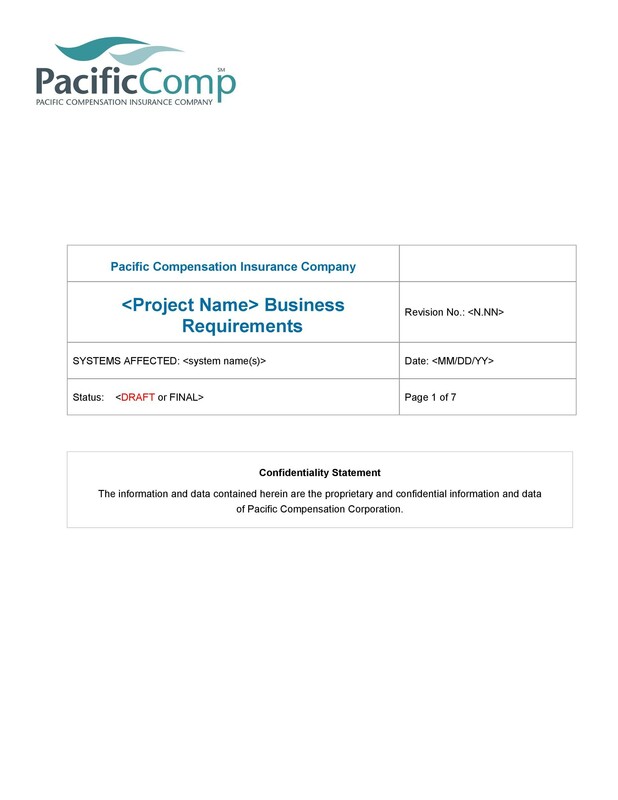 The name of the company requiring the document and material contained therein. 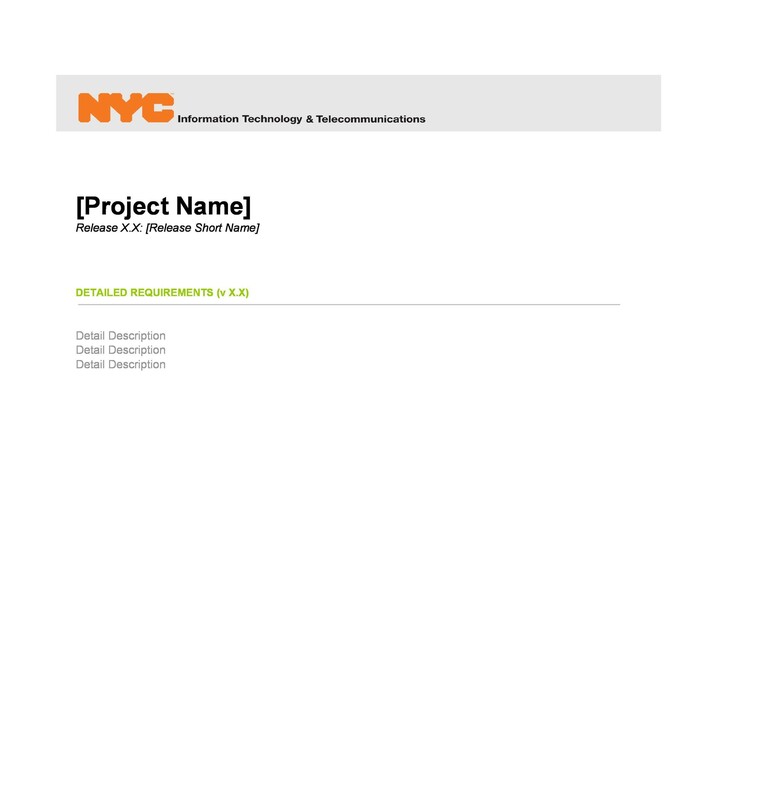 A brief and concise description of the project or undertaking. 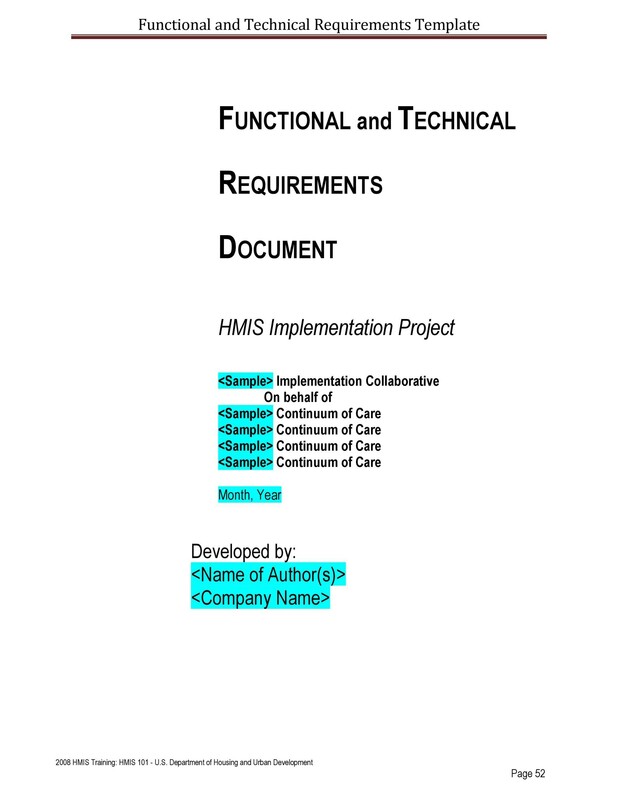 The name of the person responsible for the document’s preparation. The company the document creator works for, if applicable. A head line reading “Table of Contents.” This headline needs to stand out. The font should be a different color than the regular text. The font should also be a degree or two larger than the font appearing in the body of the report. By making the headers bigger and different color, it will allow for the easy of identification and smooths the pathway to focusing attention on a specific portion of the report if so desired. 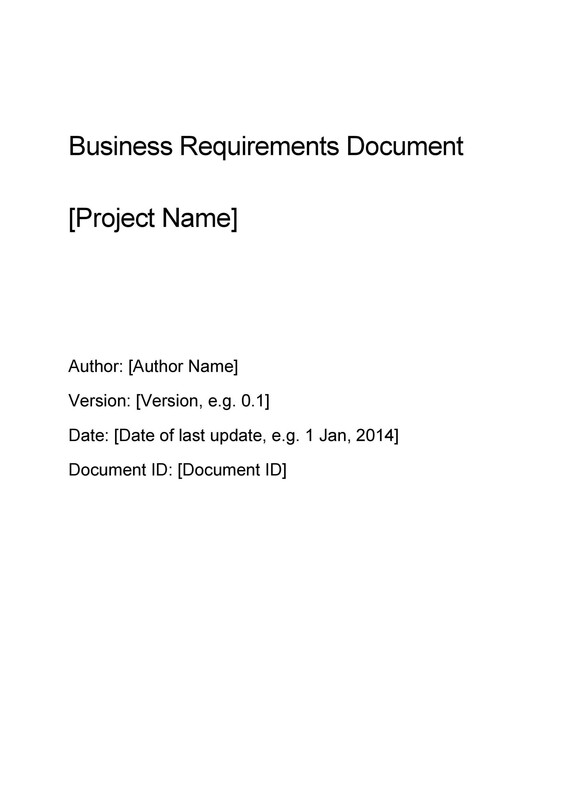 The executive summary in the business requirements document is about three paragraphs in length. Each paragraph should contain no less than three sentences to give the summary a full, informative body of material. 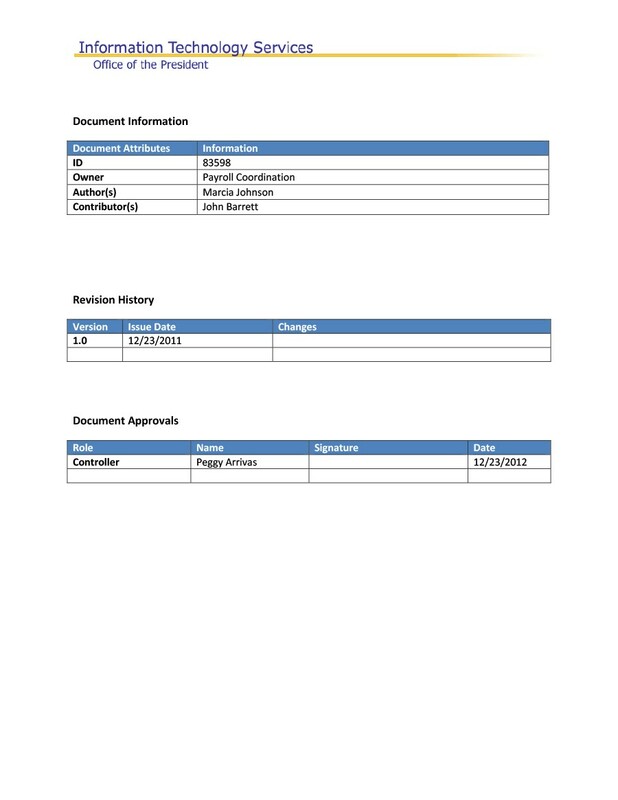 The summary reveals terse information about the material inside the report and the reason why the report is available in the first place. 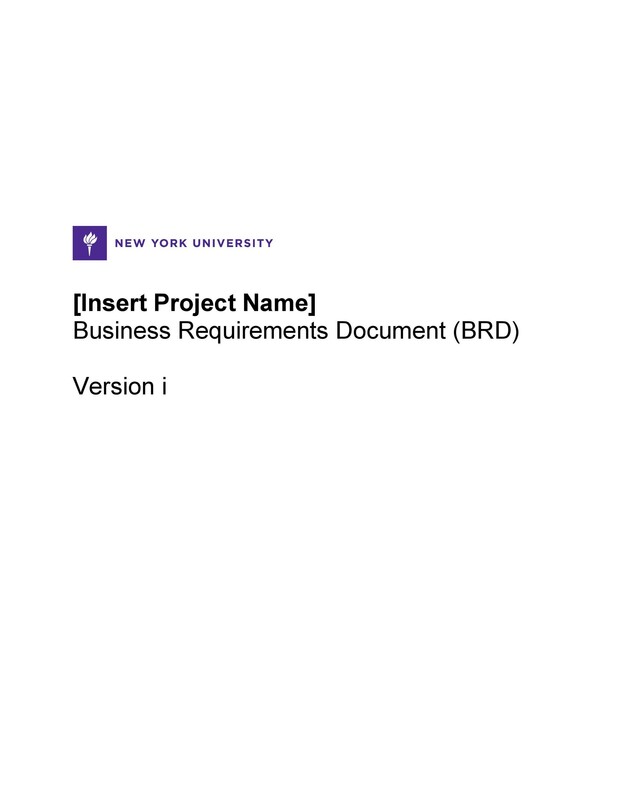 When writing the BRD, many writers make the decision to fill out the Executive Summary last. 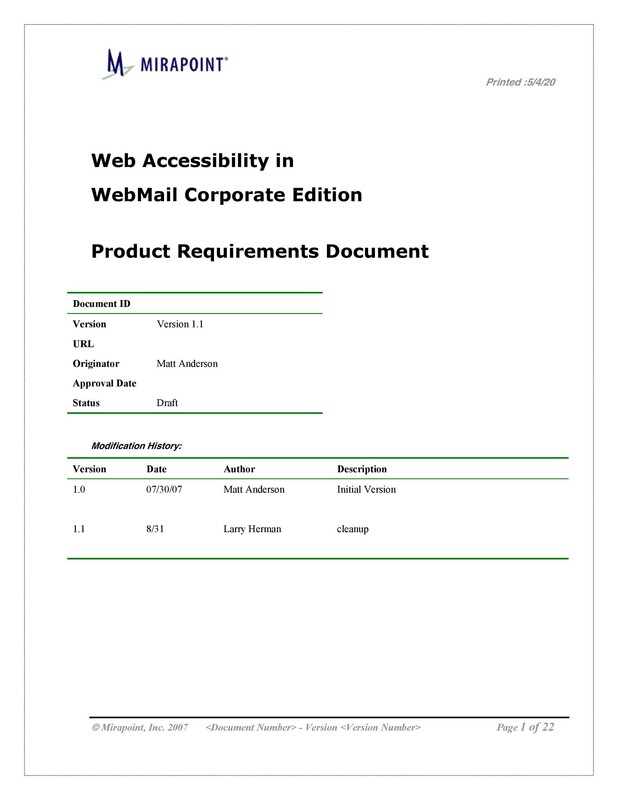 It allows the main introduction to encapsulate the information the document contains with greater clarity. 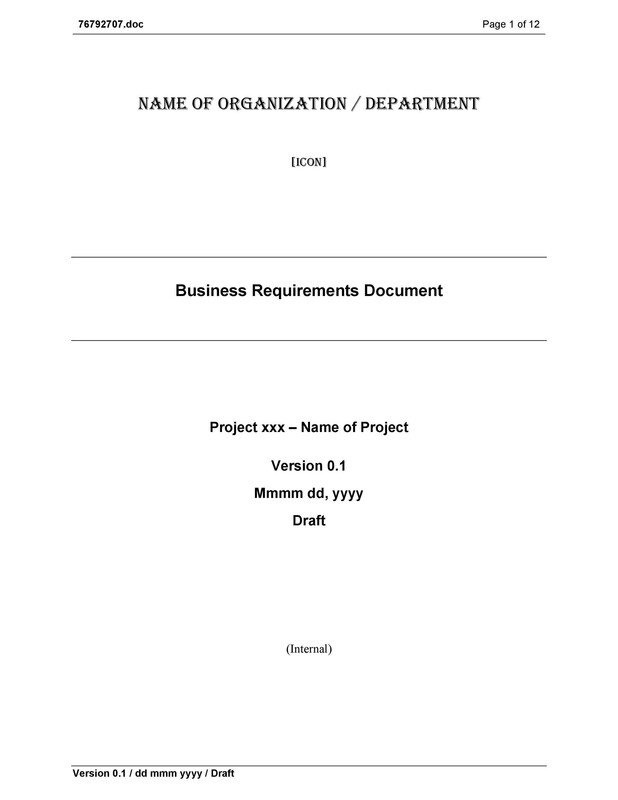 The business requirements document template will contain a section offering the most current practices the business engages in, the basic history of the business, and the business needs specific and in relation to the solution they are looking to implement with the launch of the project being described. 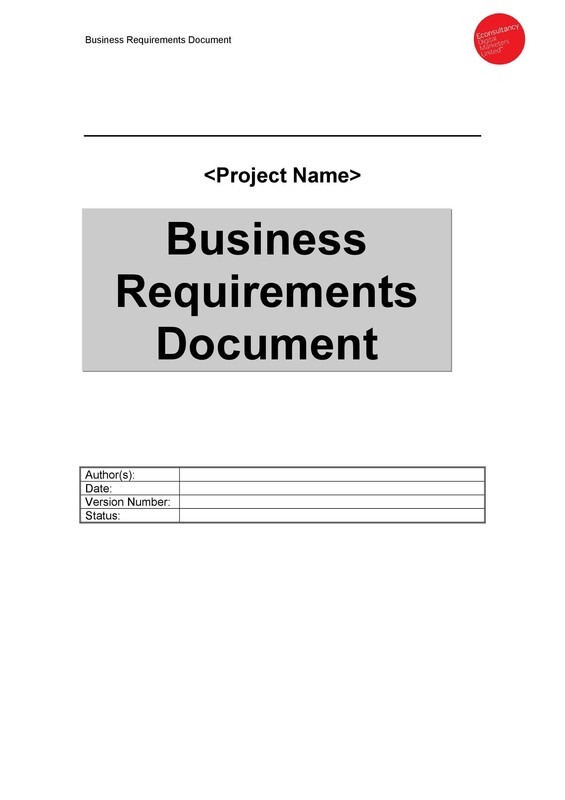 The business requirements document template reveals the scope of the work involved in getting the project off the ground. 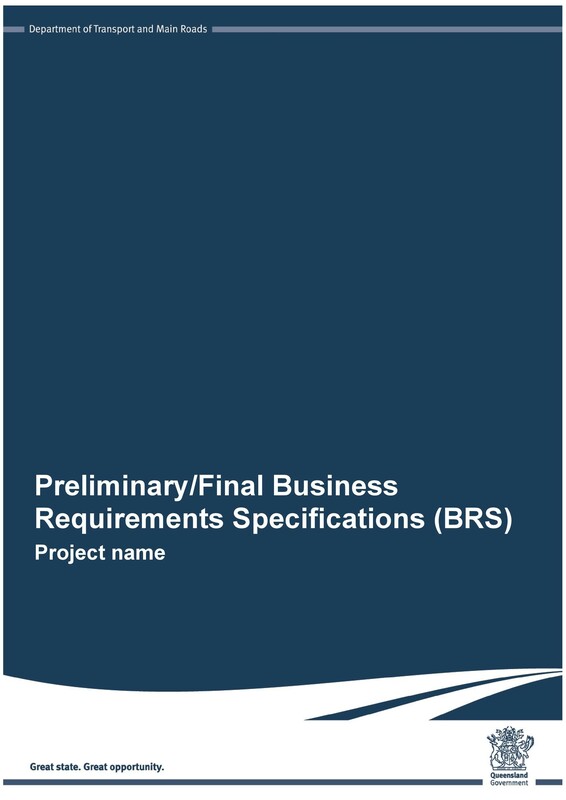 This section needs to be well-defined as it allows for the examination of any potential problems and if there is an overrun regarding project costs. Here, if we use the mobile software example, the features of the product are presented through the view of the imagined end user. The section will explain in detail how the application operates, its features, how it navigated, and what the user will experience once the software is a tangible creation. This is a continuation of the features section and reveals in explicit detail how the application will serve the end user when it is completed. Here there might be things like diagrams and images or flow charts for ease of visualization and greater clarity. Minor specifications and technical information appear in this section as well, but it is written for the lay business person to understand as well. 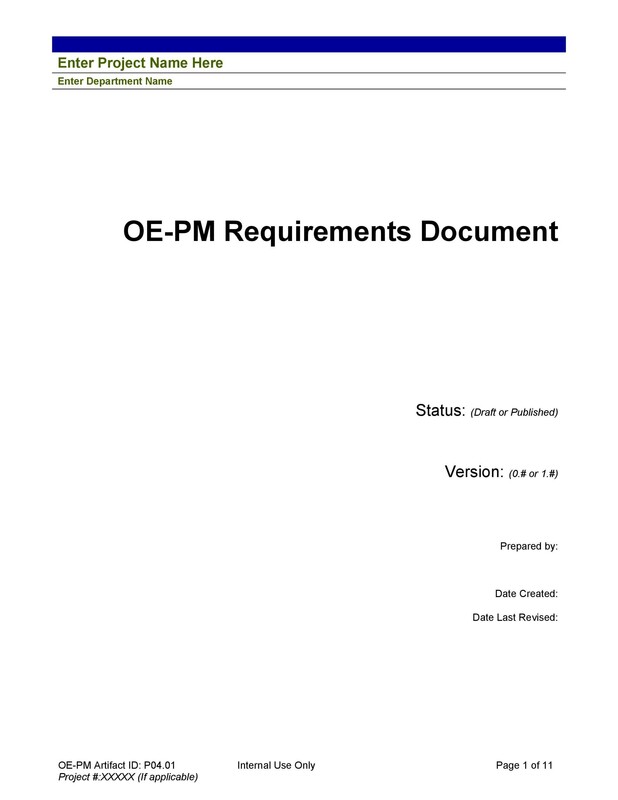 If there are personnel requirements involved in the project they are included in this section. This will indicate who will work on what aspects and the skills the people must get the job done. 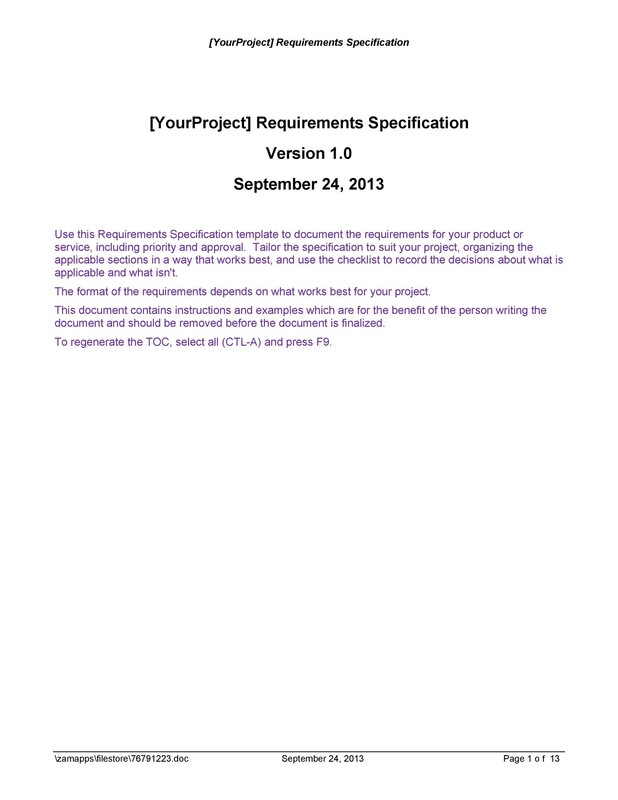 A description of how specific project needs will be addressed is an expectation. This will explain in plain language how the project or production will be overseen. The information on quality control is the means for measuring progress appear in this section. It will help define the smooth completion of the undertaking. 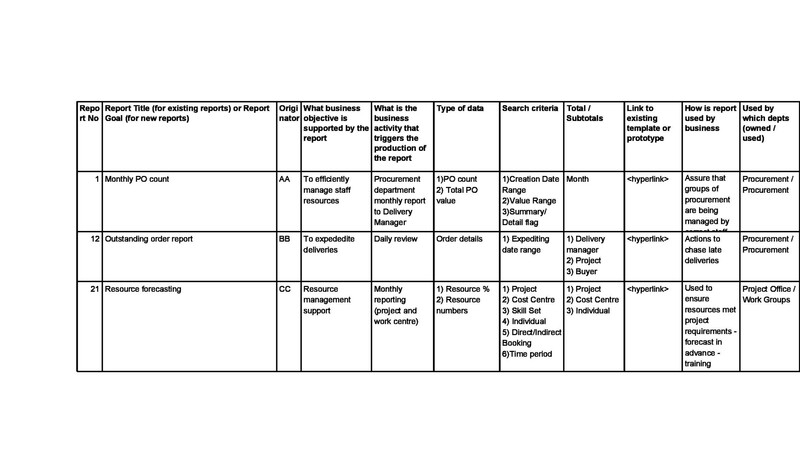 This section is where information that is based on any assumptions about business functions and processes is added. It allows the business owner to clarify and correct any erroneous assumptions. If errors are made, the truth the business owner shares will help in redefining the direction of the business. 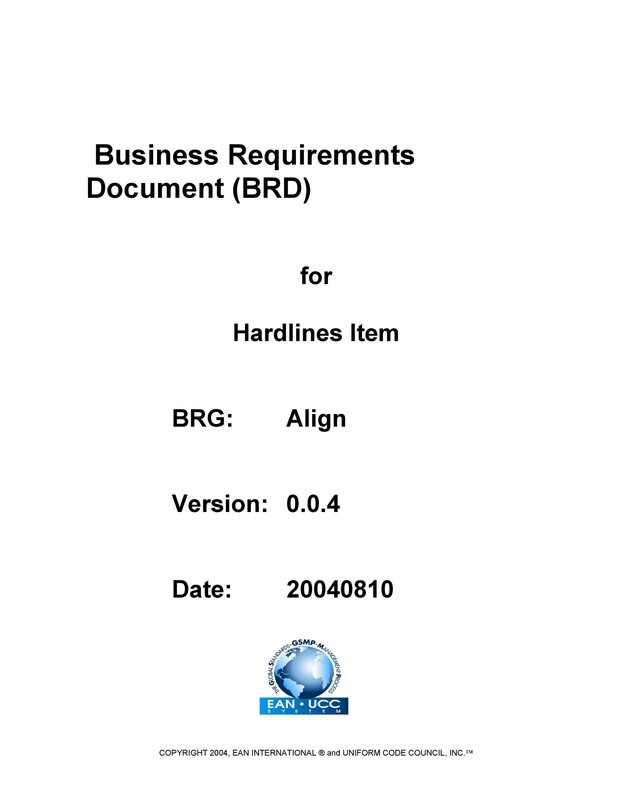 Here the creator of the BDR must indicate any limitations that the company will face in terms of project time, cost, completion, access to personnel or limiting technical information. Complete information opens the project up for clear, concise discussion and the pursuit of problem-solving endeavors. The business must be made aware of potential risks. The project might run into problems, equipment failures, delays, and other unexpected issues. It is the job of the BDR’s author to make a full assessment of any possible problems. Forewarned is forearmed. 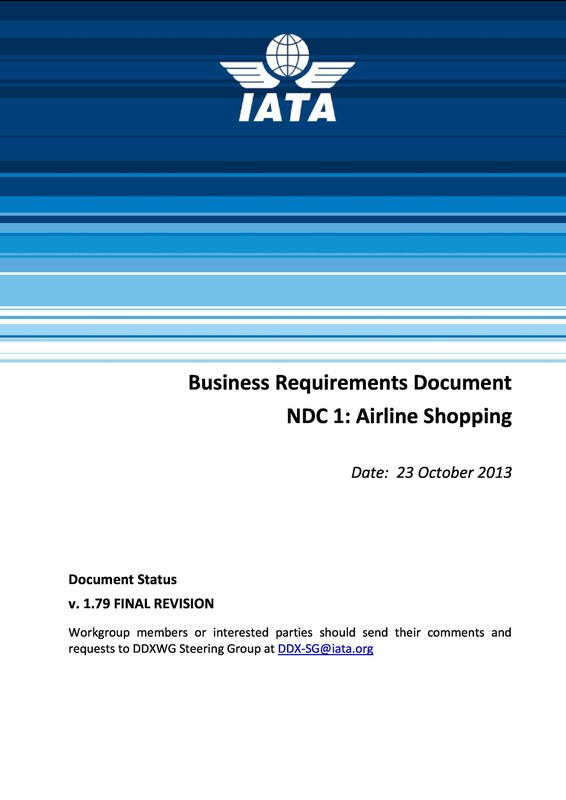 If any lingo and business slang or terminology appears in the document, it needs to be defined here. It lets the report viewer know right where to turn when they don’t understand certain terminology. 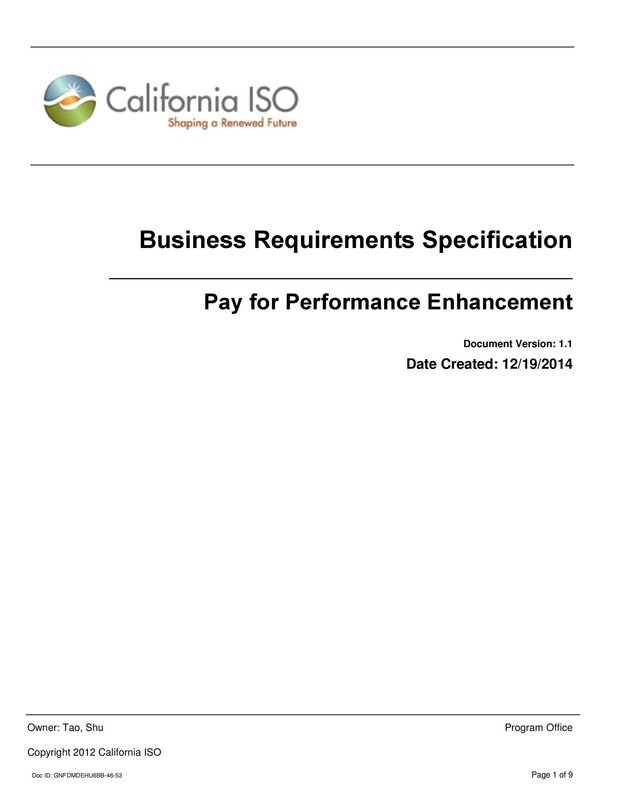 Given the weighty importance of a BDR, it’s imperative the document is created correctly. 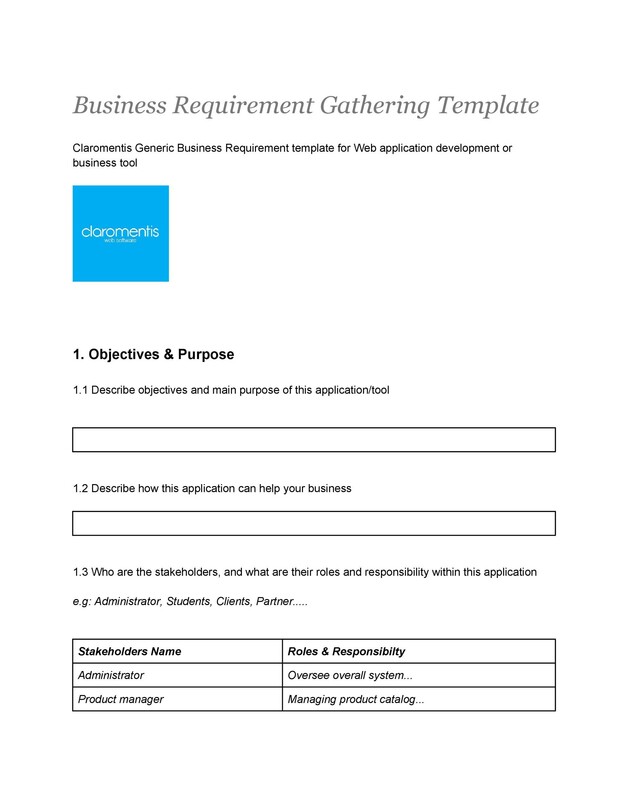 A business requirements document template makes it easy to fill in the necessary information. The template is already in linear order. It lets the user put in the necessary information and to produce an effective, professional document. 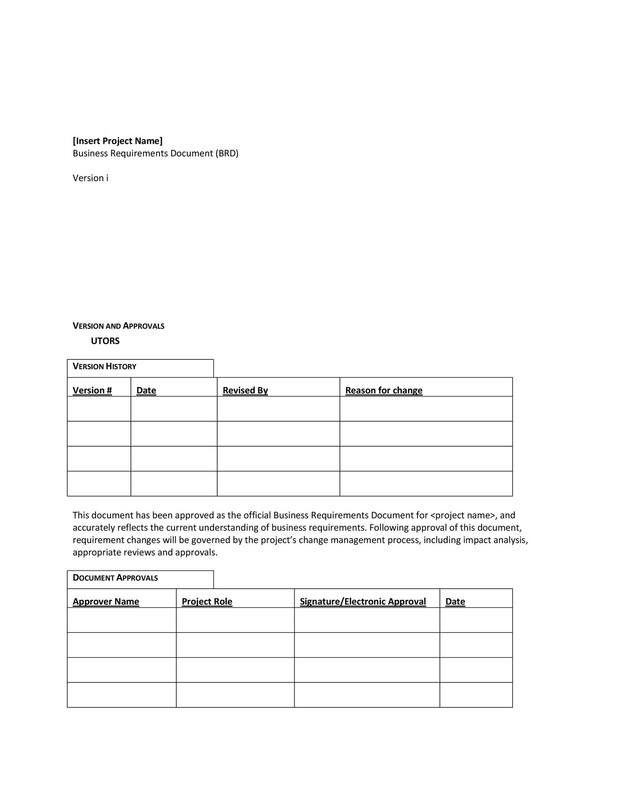 The business requirements document template makes things easier on the document creator as well as the reader(s) of the finished professional report.